Comedian, host, and tennis player, Alexandre Barrette is this year’s spokesperson of Rogers Cup presented by National Bank which will be held from August 3-12. We caught up with him recently to learn more about his passion for tennis. 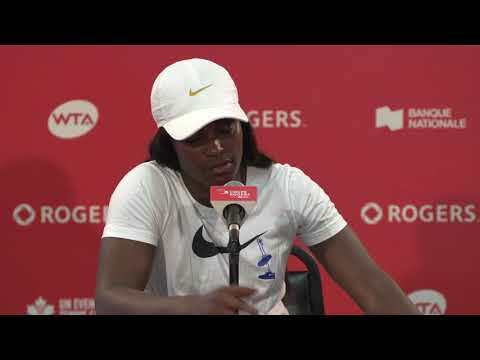 What does it mean to you to be asked to be spokesperson of Rogers Cup? Alexandre Barrette: I’ve played tennis all my life, since I was 7 or 8 years old, and it was my dream to become a professional tennis player which I didn’t accomplish, but I’ve always followed all the tournaments during the year. For me, being spokesperson of a prestigious tournament like Rogers Cup is an honour. Have you been coming to the tournament for as long as you’ve been playing tennis? A.B. : Yes, I used to come with my Dad when it was known as the Du Maurier Open, it must have been the 1990s. Since then, I have only missed two or three tournaments. What’s your best tournament memory? A.B. : I wasn’t there, but when Simon Larose led 4-0 against Andre Agassi, who is my idol. Larose beat Gustavo Kuerten in the previous round if I remember correctly. I also often came to watch Sébastien Lareau. My old coach was his coach and we had VIP passes. I watched Agassi against Michael Chang from the first row next to the court. It was an incredible match. I also saw Agassi play against Rafael Nadal in the final here when Nadal was just arriving on the tour and he was a bit arrogant and I didn’t like him. He beat Agassi and I didn’t take it well. I have seen a lot of players practice as well, which is really important for me. Last summer, Verdasco was training with two hitting partners on National Bank Court. They started practicing at 6 p.m. while everyone else was on Centre Court watching the evening matches. I watched them thinking they would hit for 10-15 minutes, but the intensity kept rising and Verdasco kept hitting every ball as hard as he could and didn’t miss one. They hit like that for an hour and a half! I think that was more impressive then any match I’ve seen. There are so many other moments that come to mind. Shapovalov beating Nadal last year even if I wasn’t there… I was busy doing interviews… I was mad to have missed that! I hope that Félix Auger-Aliassime has the same kind of run someday soon in Montreal. There’s so many incredible moments, but seeing Nadal, Federer, Agassi is an opportunity of a lifetime! They have not only had a huge impact on tennis, but sports in general, that’s what is so impressive. Even if you don’t follow tennis you know who Nadal is. Same thing for Serena Williams. What’s she’s accomplished and still achieving today is remarkable. I have seen so many great players. Which players are you looking forward to seeing in Montreal this year? A.B. 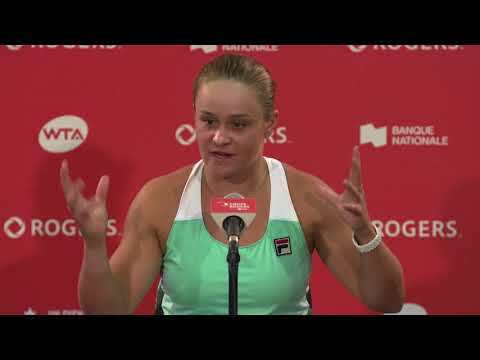 : I have been a fan of Ashleigh Barty for the past few years. I followed her last year at Wimbledon esp. I like her style, she’s a complete player: she can slice, she puts spin on the ball, she comes to the net. She’s small in stature, but she’s unique. who just hit the ball hard. I enjoy watching Barty more than Serena for that reason even though I can’t wait to see Serena. If you could interview any player who would it be and what would you ask her? A.B. : If I spoke English well, Heather Watson. She’s pretty. I would ask her “Do you want to go on a date tonight? (Laughs). Monica Puig is very pretty too. If you could create the perfect tennis player, whose strokes and qualities would you choose? A.B. : I would take Serena’s serve, Halep’s forehand, Daria Kasatkina’s backhand and Venus Williams’ mental strength. For personality, I like Victoria Azarenka a lot. She’s a bit of a show off like Novak Djokovic and she’s able to laugh at herself. I don’t like players who are too serious. Serious in a match yes, but they have to show their human side a bit. I like Azarenka for that. For agility, I would say Kasatkina and for slices, Barty. As you can see, our spokesperson definitely knows his tennis! His passion for the sport is undeniable and you will certainly cross paths with him at some point during the ten days of the tournament.